Shopping centres might present a united face to the public, but running them can be a more complicated experience than visitors think, with multiple parties including retailers, leasing managers, building managers, and owners frequently operating separately from each other. Waterloo, Ont.-based Mappedin is slowly changing that, by building a computerized display platform that not only helps visitors navigate shopping centres using their smartphones and digital kiosks, but serves as a collaborative database management tool behind the scenes. In fact, one of its biggest proponents is none other than Toronto-based Cadillac Fairview Corp., owners of more than four dozen malls across the country including Toronto’s Eaton Centre, Ottawa’s Rideau Centre, Vancouver’s Pacific Centre, and Winnipeg’s Polo Park. Surprisingly, Liu says, the majority of Canadian malls rarely prepare that sort of information more than a week in advance, with retailers often managing their own promotions separately from the mall manager, who works separately from the leasing manager. The first knows about a store’s deals, the second about special events, and the third about pop-up stores and whether tenants are closing – but they don’t speak with each other. Like many startups, Mappedin began as a side project. It was 2011, and Liu was studying engineering at the University of Waterloo. Then one of the people Liu and his classmates showed the platform to offered to connect them with the general manager of a local mall, and it only took a 15-minute presentation for the team to demonstrate how they believed their platform would be an improvement over the mall’s existing directory. In September 2011, the manager told Liu’s team she wanted a digital map by Christmas. “It’s been an exponential ramp up ever since,” he says. As for Cadillac Fairview, Liu first met with the company’s executive team in March 2015, when they were still working with a competitor that was providing what Liu acknowledges were similar services at two of its malls. But he knew that Mappedin’s real-time indexing features could set it apart. “We showed up and said, ‘here’s what we know is hard,’ which is indexing in real-time, ‘and here’s how we solve it,’” he says. As a trial, Cadillac Fairview implemented Mappedin’s platform at Vancouver, B.C.’s Pacific Centre last May, providing visitors with map and search functions, and retailers with a system in which they could enter promotions, job postings, and even CMS information. One month later they received a deal for the entire portfolio – thanks to Mappedin’s plaform, visitors and retailers alike can now access the system from desktops, kiosks, and mobile devices at every Cadillac Fairview-branded mall. 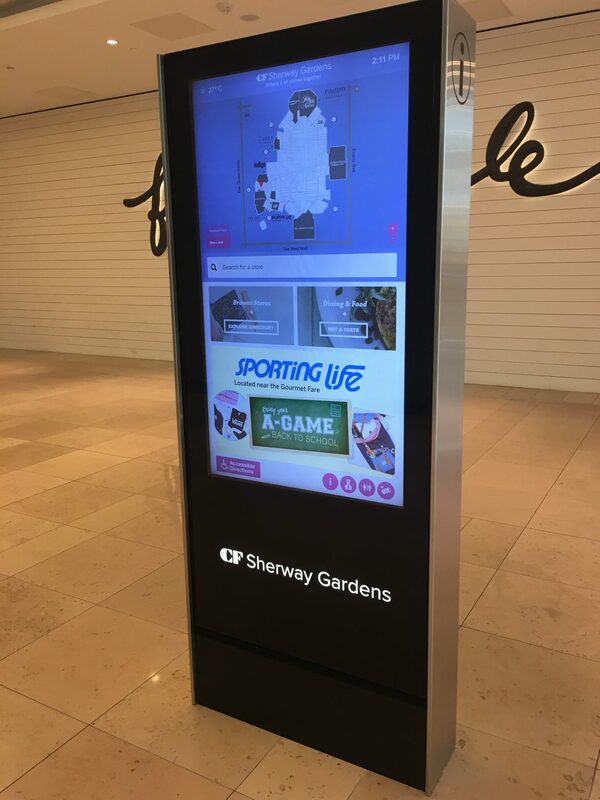 A Mappedin-powered digital kiosk at Cadillac Fairview’s Sherway Gardens in Etobicoke, Ont. Adam Benson, Cadillac Fairview’s senior director of digital marketing, echoes Liu’s account, noting that the company evaluated a number of potential partners but believed Mappedin had the strongest platform. Each Cadillac Fairview retailer now has their own account and set of permissions identifying the fields they can change, with Cadillac Fairview’s marketing managers having the opportunity to approve or reject them, Liu says. “As you can imagine, it really makes it easier, because the alternative is marketing managers getting 100 e-mails a week,” he says. Yet it’s not the easy access to a companywide CMS, or even its mapping features, that has been the platform’s greatest benefit to Cadillac Fairview, Benson says: it’s the platform’s search functions, which allow Cadillac Fairview to learn about customer habits and needs based on their queries, and even augment their results with keywords, retailers, and products that correspond to the centre they’re visiting. Those smart suggestions and push notifications are just two features of many that Mappedin has added to its platform based on customer feedback, Liu says. And if Benson’s comments are anything to go by, the feeling is mutual.